Trazodone is an antidepressant available as various brands. 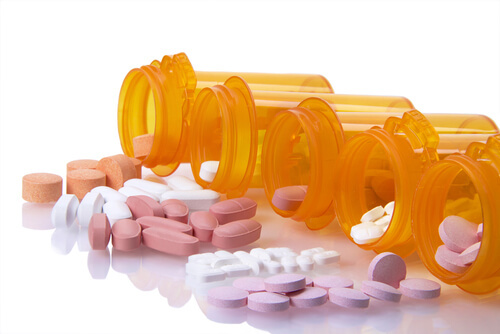 There are several Trazodone brand names available from different manufacturers. Generic and trade formulations of the medicine can be obtained legally only by prescription. Some people abuse it for euphoric effects, and it is sold illegally on the streets where it is called by various names. What Are Trazodone Generic And Brand Names? What Is Trazodone Called In Street Slang? Why Should One Know Trazodone Other Names? Listed below are the most common Trazodone generic names and brands sold all over the world by prescription. Trazodone is the generic form of the drug. It is a copy of the branded formulations such as Oleptro and Desyrel. It has the same dosage, indications, administration routes, and safety profile. 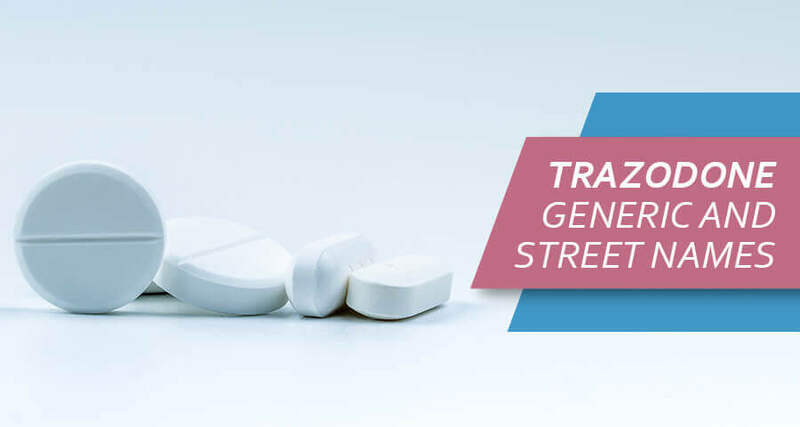 Both generic and branded forms have the same short and long term effects of Trazodone. Trazodone Hydrochloride: Canadian pharmaceutical company Apotex Inc. manufactures this generic form in 50 mg, 100 mg, 150 mg, and 300 mg oral tablets. It is also made and sold by Alvogen, a company based in Pine Brook, New Jersey. Teva Pharms USA, a subsidiary of Israel-based Teva Pharmaceuticals, makes this medication in a 50-mg and 100-mg dose. Other Generic Trazodone Manufacturers: Plivia makes this medication in 50-, 100-, and 150-mg strengths. The 50-mg tablet is marked SL 433 and is white and round. The 150-mg strength has SL 441 imprinted on it and is divided into three sections with 50, 50, 50 marked on the flip side. Several other companies manufacture the medicine, including Oxford Pharms, Sun Pharm Industries, Torrent, Accord Healthcare, Zydus Pharms USA Inc., and BARR. The majority of tablets are round or oval in shape and white in color with various markings on them. For example, the 300-mg dose from BARR is an elliptical white tablet marked barr 733 on one side and three sections with 100, 100, 100 on the other side. Oleptro: This is an extended-release formulation of the drug that was first approved by the United States Food and Drug Administration in 2010. It is manufactured by pharmaceutical company Labopharm, Inc., as a once-daily treatment for major depressive disorder. Per the FDA website, Oleptro manufacturer Angelini Pharma has discontinued making this brand. Desyrel: This is manufactured by Pragma as well as other pharmaceutical companies in 50 mg, 100 mg, 150 mg, and 300 mg formulations. Desyrel and Desyrel Dividose are some of the most common brands of the drug in the United States. Trialodine: This has been discontinued in the United States. It was previously manufactured by Quantum Pharmics in the 50-mg oral tablet form. Molipaxin: This is a Trazodone brand available in the United Kingdom. It is manufactured by Zentiva. Trazorel: This is sold in Canada by companies such as Valeant Pharmaceuticals and ICN Pharmaceuticals in 50, 100, and 150 mg doses. Trittico: The drug is available as brand Trittico worldwide, including Greece, Italy, Hungary, Egypt, Colombia, Chile, Hong Kong, South Korea, and Singapore. Although Trazodone drug class is not a scheduled substance, this medication is available only by prescription. People who abuse generic or Trazodone brand name may develop an addiction and experience Trazodone withdrawal symptoms when they don’t get the medicine. Less commonly, people obtain it on the street for Trazodone weight loss. Some addicts who use cocaine, LSD, ecstasy, or amphetamines begin snorting Trazodone to enhance or prolong the effects of hard drugs. Drug abusers obtain the medicine on the street where it is available under various names. The most common street slang for this antidepressant is “sleepeasy.” This is derived from the fact that many drug users who are abusing stimulants use Trazodone name brand to fall asleep. Others who are addicted to oxycodone or heroin use this medication to lift their mood and sleep more easily. The other slang term for Desyrel is “goopenthal.” This term was first used at the TV-show to identify all the types of psychoactive medications and then became widely used by the younger population. The various derivatives from the term can also be used. Anything that sounds like “trazzy,” “trazzer,” “traz,” or “trazo” likely stands for the Trazodone. There are several reasons to know what another name for Trazodone could be. Knowing the other names makes it easier to tell if a brand name drug prescribed by a physician is this serotonin modulator. 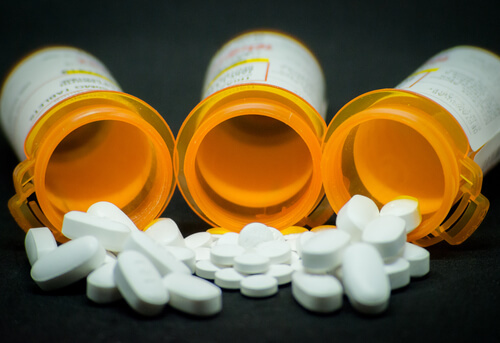 If a person needs to purchase the medication while traveling or living in another country, it’s helpful to know the Trazodone trade name there. It is useful to know the different names of this medication to ensure one does not take it with other drugs that interact with it, for example, Trazodone and Wellbutrin. For people who have an allergy or intolerance to the medication, it is essential to know the different names it is available under. While every brand name of Trazodone contains the same active ingredient, the inactive ingredients may be different and may be the cause of the allergic reaction. Knowing the different names is useful to identify which brand is approved and which has been discontinued. People abusing drugs use street names to avoid getting caught. It is helpful for parents of teenagers and loved ones of drug users to be aware of the common slang names used by dealers and addicts. Knowing various generic, brand, and street names can help prevent someone from maliciously spiking food or drink with the drug. Such people often refer to the drug by different names and knowing these names helps one stay safe. Is Trazodone safe? It is an effective antidepressant when used as prescribed and under the supervision of a medical professional. Can you overdose on Trazodone? Yes, it is indeed possible, although uncommon. The maximum prescribed Trazodone dose range is usually 400-600 mg in divided doses, and anything over this is an overdose. Knowing the generic name for Trazodone as well as its brand and street names is useful in preventing an accidental overdose. In case the signs of addiction were noticed in a medication user, it is essential to start the substance abuse treatment immediately. The rehab options include both inpatient and outpatient facilities that tailor their medical approach to the needs of each.